I love Asian-style vegetarian food, like these utterly delicious spicy Indian fritters (pakoras). Traditional pakoras are usually made with ordinary potatoes but I wanted mine to be healthier so I am using sweet potatoes instead. Pakoras are gluten-free as the vegetables in these fritters are bound together with chickpea (gram/besan) flour. This recipe will make 8 spicy Indian fritters. 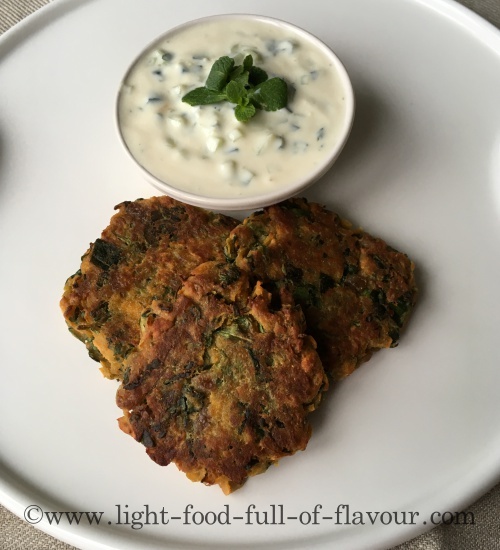 You can serve them with raita (see recipe below) or with my Tomato Chilli Jam and Asian-Style Carrot Salad as a light lunch or as part of a buffet. I brown the fritters in a frying pan before placing them on a baking tray and finishing them off in the oven. Preheat the oven to 220C, Fan 200C, 425F, gas mark 7. Add the coconut oil to a large frying pan over a medium-hot heat and add the onion, garlic and ginger to the pan. Keep stirring for about 3 minutes. Add the ground spices and the salt to the pan and keep stirring for a further 2 minutes. Turn off the heat and place the pan to the side to let the mixture cool down. Add the chickpea flour, grated sweet potatoes and chopped spinach and coriander (cilantro) to a large bowl and mix together. Once the onion and spinach mix has cooled down add this to the bowl as well together with the cold water and mix everything together. Cover a baking tray with baking parchment. With your hands, form 8 patties and place them on a plate. Add some more coconut oil to a large frying pan over a medium-high heat. Once the oil is hot, fry four of the patties one minute on each side, until nicely browned, before placing the fritters on the baking tray. Do the same with the remaining four patties. Place the baking tray in the pre-heated oven and cook for five minutes. If you are serving the fritters with raita, simply mix together all the ingredients for the raita in a bowl. Serve the pakoras with your choice of accompaniment.